WE'RE ALL ABOUT THE TASTE. 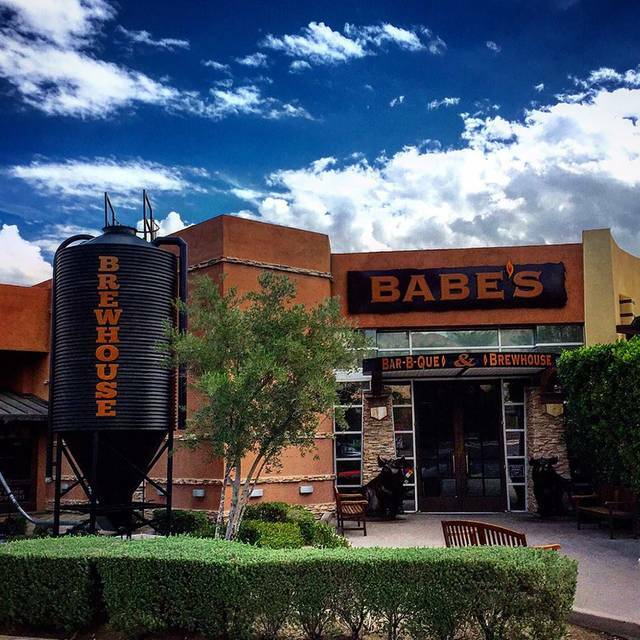 Babe's Bar-b-que & Brewhouse, centrally located at The River, opened its famous doors in 2002, the dream come true of founder Don Callender (yes, that Callender), Today, Babe's Bar-B-Que & Brewhouse is a successful testament to his vision. THERE’S NOTHING LIKE IT IN COACHELLA VALLEY. That's why folks come from Orange County, San Diego and all over the world whenever they're in town. 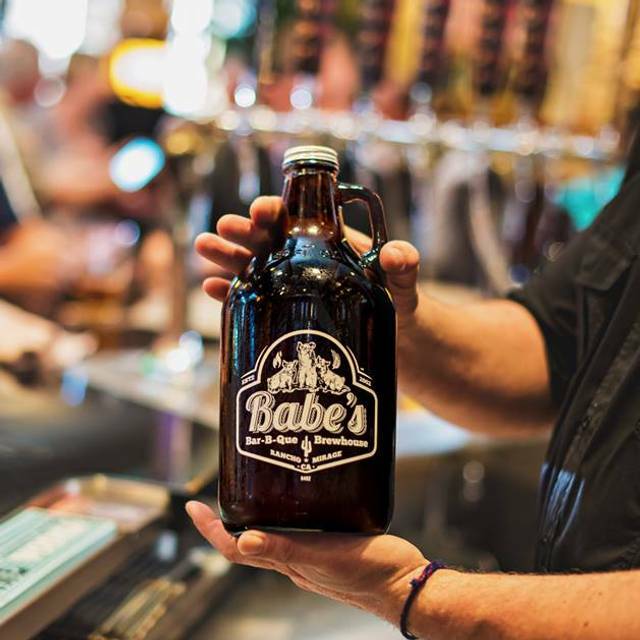 And why locals choose Babe's as their favorite, all-season hangout for dinner and a movie or shopping, Happy Hour and definitely for Monday Beer Appreciation Day. There are franchises galore you can visit anytime. But there's only one Babe's. 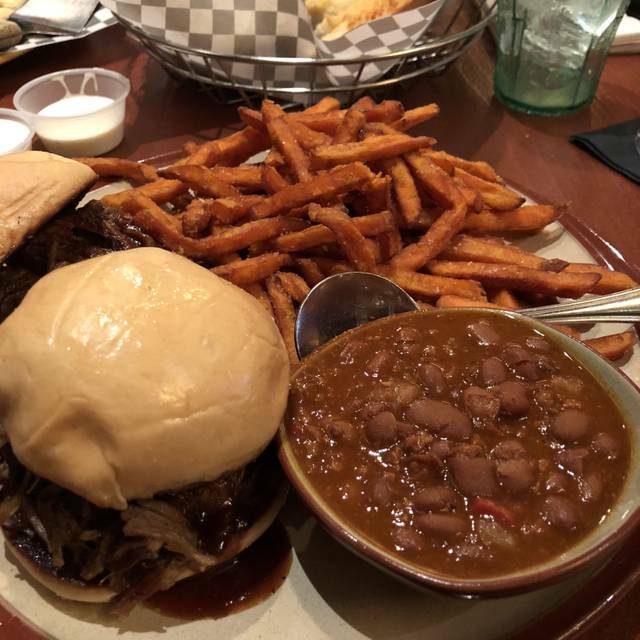 So big they're served with choice of one side: French fries, sweet potato fries, cole slaw, baked beans, or turkey chili. Art's Southern Spicy Pickles Available On Request! "Try Some!" Check availability with your server As DC would say, "Here today, gone tamale!" Craft beer friendly. Fresh wild Northern Pacific cod, southern fried. Add traditional cole slaw $2. Our cod is delivered fresh daily. Selling out is guaranteed! Include your email address to receive monthly newsletter with special dining offers from Babe's! Baby backed ribs are fantastic. Also had the orange peach tea was a also great. Every time we’re in the Palm Desert area we go to Babe’s. We’ll be back. Babes is always delicious and excellent! Asked for an outside table on our reservation but when we arrived at least 80% the patio was empty but we were told we’d have to wait 20-30 minutes for an outside table as they needed to clear tables ! inside the restaurant was moderately full no one waiting your staff was not especially busy — I saw one woman cleaning high chair another rolling cutlery in napkins.......we were very disappointed as we are regulars and always eat in the patio not good customer service! We like the place. We’ve been there often, and we’ll return. It’s a bit “different,” which is part of what we like. The servers are all very hard-working, as are the bussers. Though it would erode the servers’ incomes to have another one or more per shift, with a bit more attention, the restaurant would even be a lot better. It doesn’t seem to hurt their patronage, however. During high season, they’re full and with people waiting. Therefore, whatever the season, you’re encouraged to make an Open Table reservation. If you prefer to sit outside on their very large (road-facing) patio, be sure to specify that in the reservation. Lots of free parking, though you may have to walk a bit (just keep that in mind, and it’s not a problem). Sat our large group in side room. It was awesome. Wonderful time celebrating my son's birthday. Food was outstanding! The food was mediocre. The potatoes were tepid and sort of greasy. One of our party ordered salmon (acknowledged risk) and it came out overdone and tough. The ribs were average -- and that's the specialty! In full disclosure, I'm from Memphis, so . . . The service was attentive but must have been instructed to "turn the tables." In summary, our table left feeling like a number. At the restaurant's price point, there are other options nearby or even in The River. At table for 20 minutes with no server. Like we were invisible. Had to ask hostess to get us one. Server that eventually showed was fine. We sat outside (our choice). The misters were on and they wanted to sit us at a table where the misters had been dripping and the chair was wet. We requested a different table and they accommodated. Service was slow. They brought my kid the wrong drink. They left an ingredient off of my pizza. (The crust was disappointing.) They forgot to bring one of my kids an item they had ordered. We sat there for a long time after finishing our food waiting for our check so we could leave. We asked for 3 takeaway boxes and received 2. The restaurant is cute. Ambiance is nice. Food is meh. Service is bad. Go somewhere else. While the 1st two prior experiences were good, Babe's for my birthday dinner was below par. Three out of four beers on the menu that we asked for were out of stock, so we had to make another selection. It took forever for the waitress to return to take our drinks order only to learn that another beer we wanted was also out of stock. 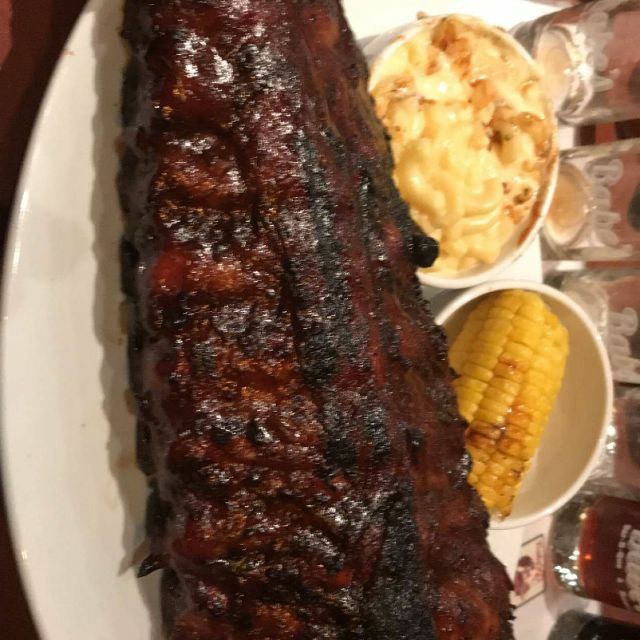 Things went downhill from there, the baby back ribs were good but the macaroni side tasted blah and had a grainy consistency. Then, while several of us were still eating our entrée, the waitress asked if we wanted dessert. We told the waitress that we were getting pretty full but didn't know yet. Next thing we knew, the bill was on our table while we hadn't even finished yet! One of our guests asked her, "what if we wanted dessert?" The waitress snottily replied, "well, you told me you were getting full so I figured you didn't want any." Babe's … you've got some staff training to do! We reserved a table on the patio for 6 guests. We had to move as the cool spray kept dripping. Our waitress was very accommodating at this point. 4 of us ordered ribs and two ordered the fish . The ribs arrived; there was a mix up as to St Louis or the back ribs. The waitress was very adamant she had put the order in correctly and kept coming back to reassure us that the order was right; although she did not seem to know the difference between themThat said the fish was excellent. The bartender was very accomodating; we just went to the bar and got our own after dinner drinks. The waitress could not open the wine; we had to do it for her! She was busy; after dinner was served we didn’t see much of her again! The fire pit is a nice touch; we did enjoy sitting around it after dinner! One of the couples in our group had not been to Babes in 20 years. It was the first time for the other 4. Have to say; for a rib place, they were not the best! We won’t be back I’m afraid,lots of better restaurants! Our Server Ray was a really cool guy my daughter loved him thought he was hilarious. I like babes there were a few mistakes tonight however they brought out mashed potatoes instead of Mac n cheese. Ray fixed it for me though and the max n cheese is great. Unfortunately the brisket was dry tonight I don’t know what happened I have had it before here and it was great, but not this evening. Place was awful a d food horrible. Excellent customer service, will return in the future. Made reservation for outdoor table. Were seated quickly. Took long time to get water, then pop after then one beer awhile after that. 3 out of 4 meals were hit and tasty. Half chicken order was cold. Sauce requested for sweet potato fries took 3 waiters to finally get it and by then fries were cold. Glad we went but would rather go to Cheesecake Factory as food hot, presentation excellent, service excellent and prices good. A noticeable decline in food quality and service to our visit 2 years ago. Still fantastic beers, large portion sizes and great atmosphere. Worst brisket ever! Lumps of coal covered in bbq sauce two people in our party had the same problem. The pork chop was chewy the pulled pork sandwich was good. The fried ocre was bland and the cornbread was doughy. The dining room is so loud you can barely hear the people across the table from you. Would not recommend. Normally we have great food here but last time mine came out first - it was cold. Back it went, meanwhile other two people were still waiting for theirs. When it was came it was excellent. Back to mine - the new Lobster Mac was piping hot and delish but by then they were out of the crab sliders so no luck with that. I think the inside restaurant was extremely hectic while we were on the patio so the problems we had could have been due to that. The manager was very apologetic. 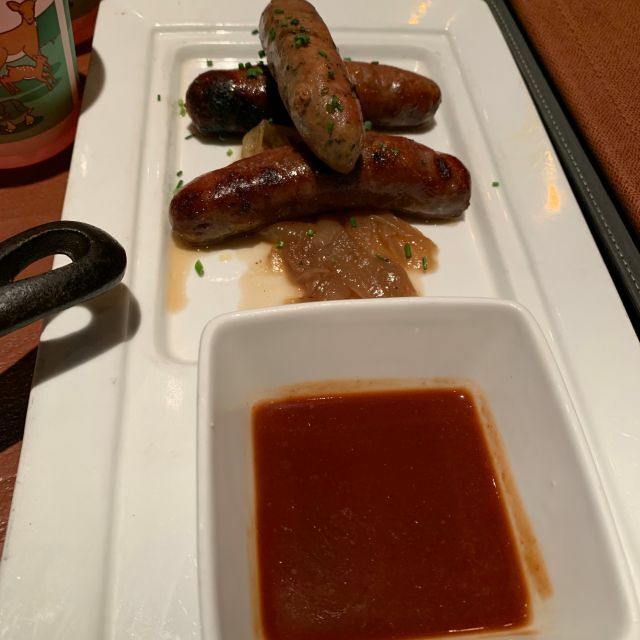 While she made several attempts to make up for it near the end of the meal, our experience with this restaurant was fairly poor, due for the most part to service. We waited over 15 minutes after being seated before anyone even acknowledged that we were there. When our server finally did come to the table, she was exasperated, rushed and seemed frustrated with our questions. Once they finally got to us, both our drink and food orders were incorrect. The food was fair, not spectacular. As mentioned, the server was friendlier and more attentive near the end of the meal, and did comp 1 drink as an apology for the issues we had. Overall though I don't think we'll be back. The food was great but our waitress may so many errors. We were so embarrassed because we took some family members out for a special dinner. We have eaten at Babe’s several times and this was our only bad experience. Normally the service and food is fantastic. I wanted to try everything on the menu since everything sounded so good. I ordered the appetizer short ribs and had plenty to eat. We had lunch at Babe's about 4 weeks ago and it was good and not many people there at the time maybe only 25% of the tables. Based on our favorable experience we told our good friends from Canada about Babe's and they wanted to go so we made dinner reservations. Our reservation was honored upon arrival and we were taken to a nice booth. The restaurant was completely full. Michael our server was prompt about taking our drink orders which arrived only about 5 minutes later. Michael took our order and also a picture of us at the table. 3 or us ordered ribs and the other person chicken. Michael again took another drink order. Michael did take very good care of us throughout. Our mains arrived after about 20 minutes. I cut into my St. Louis ribs and took a bite. They were tough and tasted burned but didn't look burned on top so I turned them over and they were absolutely black! Our friends baby backs were tough and black on top and even blacker on the bottom! My wife's baby backs ribs were quite tough. The other friend's chicken was good. We were quite embarrassed about the poor rib experience and apologized profusely to our friends. Talk about disappointed! The only good thing about the evening was the great service. Very good. However the mac & Cheese was hot and the rest of the meal was room temperature or below. Excellent service. Once ordered our food was delivered promptly. Kept water and iced tea glasses filled. Very attentive without being overbearing. Food was very good - however, I would probably order my sandwich without the bun next time as the bun got really soggy and was difficult to eat. Very busy on a Thursday early evening, great atmosphere! We tried the craft beer samplers, which we really enjoyed, service was great, food just what we thought - tasty bbq! Great food and relaxing atmosphere. We would definitely come back! Great food and service and good bar! We got a really good seat on a Saturday night and the service was great! There were six of us, 4 adults and 2 kids. We had an awesome time. We sat outside on the patio. Loved having the fire going near us in the evening. There were 2 times we could smell cigarettes from people lighting up outside the restaurant, so I’d ask for a table closer to the water next time, but overall it was a fantastic experience. The food was cooked perfectly and the portions were huge. I love their Palm Springs IPA, brewed on site. The pies are to die for. Even if you don’t eat it there, take a pie home. They’re so worth it. Better than most restaurants in the Palm Springs area. Portions were good, price was fair. Bar-b-que sauce was bland. Mac and cheese was bland. Not sure if anyone has tastebuds in California? I’ve had better meals here, but also worse. Overall grade: C.
Fantastic BBQ! As good as the BBQ in Kansas City, which is saying a lot. Best of all are the baby back ribs and brisket. We really enjoyed our ribs and chicken. Very prompt and friendly service - we enjoyed our whole meal here! 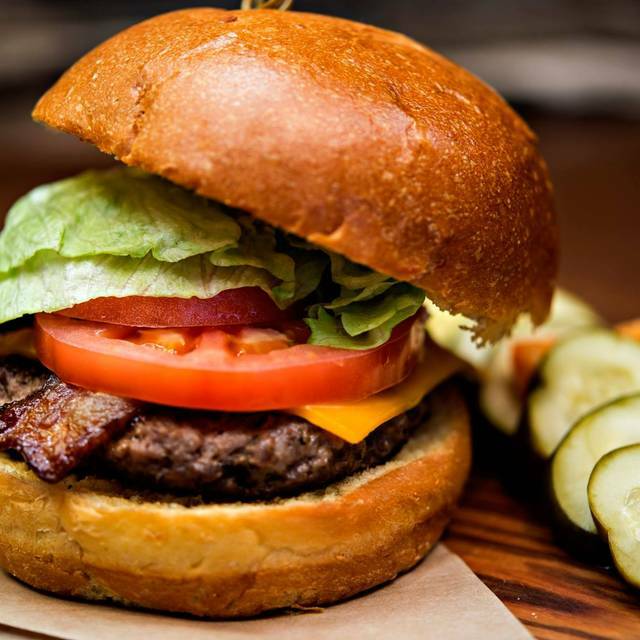 We love the food here and go every time we're in Palm Springs. Jose is a great waiter. Great place. Enjoyed decor. Very good service. The food tasted good but was not very hot. Overall good experience. Great staff. Excellent food!!!!! We enjoyed our meal and will return again soon.